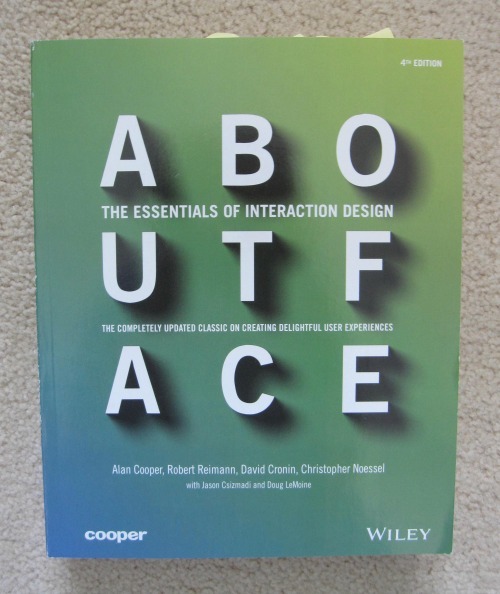 If you are interested in interaction design, About Face - The Essentials of Interaction Design, is the text book for you. Do not be put off by its size, this is 650 pages covering everything you could possibly need to know about interaction design, written by some chaps who really know their stuff, namely Alan Cooper, Robert Reimann, David Cronin and Christopher Noessel. It is split into three parts - Goal-Directed Design, Making Well-Behaved Products and Interaction Details and goes into massive detail about how to make your designs the very best possible for your users and why this is important. But while they do go into a lot of detail they have managed to make a very readable book filled with examples and images to really help you understand their points. And when discussing design principles, each principle is picked out on the page in yellow to make them easy to find again later, while all being collected together in Appendix A for easy reference. It was Leah Buley who put me onto this book via The User Experience Team of One and I am very glad she did. The fact I had already read it was a massive help when I started with General Assembly as we were sent an electronic copy of this book as pre-course reading! An instant tick and one less thing to worry about. To really get the most from this book does take a little time, but it is well worth it, giving you the tools to be a better designer; I know it has definitely helped me in my current role working on mobile apps.